Today we’d like to introduce you to Sandy Blain. Sandy, we’d love to hear your story and how you got to where you are today both personally and as an artist. 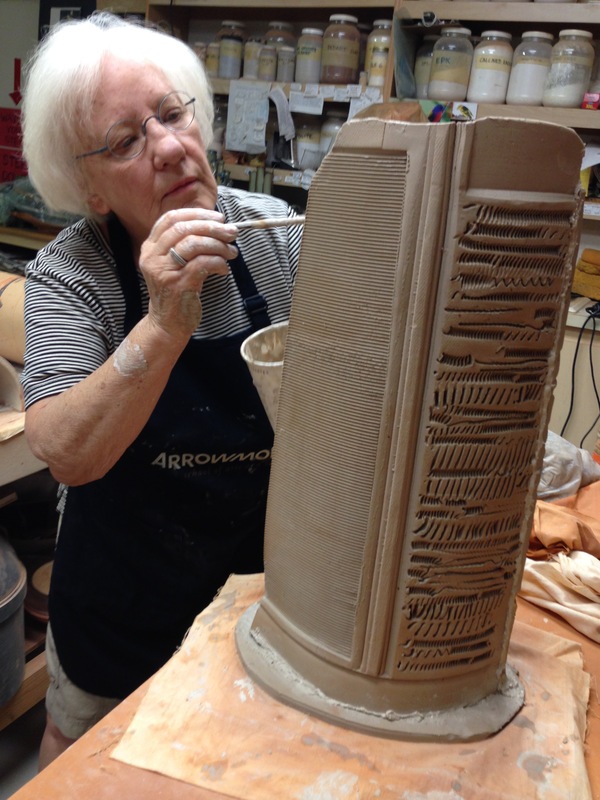 Even before becoming interested in ceramics or getting a degree in art education from Northern Illinois University, DeKalb, IL and becoming a high school art teacher in Racine, WI, Sandy worked in her grandmother’s flower shop in Chicago. It was a “hands-on” experience being occupied with planting/transplanting or flower arranging but always with an interest in the relationship of the botanicals to the container/vase. 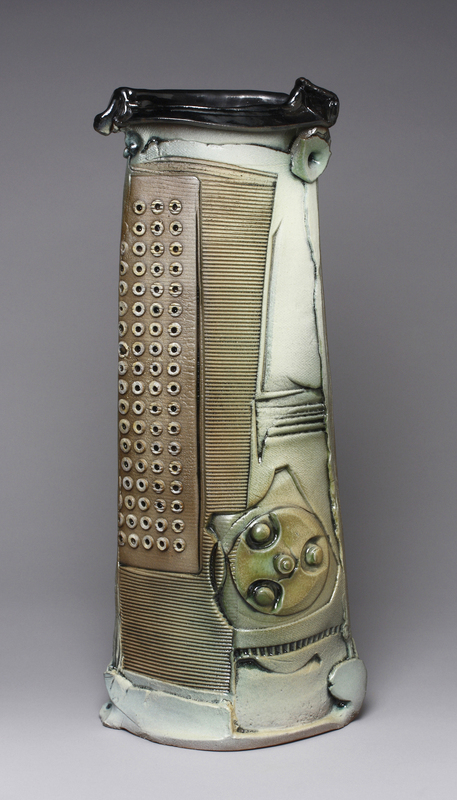 After obtaining an MFA in ceramics from the University of Wisconsin – Milwaukee, Sandy accepted a teaching position at the University of Tennessee – Knoxville, where she obtained a professorship and also held a joint appointment as Director of Arrowmont School of Arts and Crafts, Gatlinburg, TN. 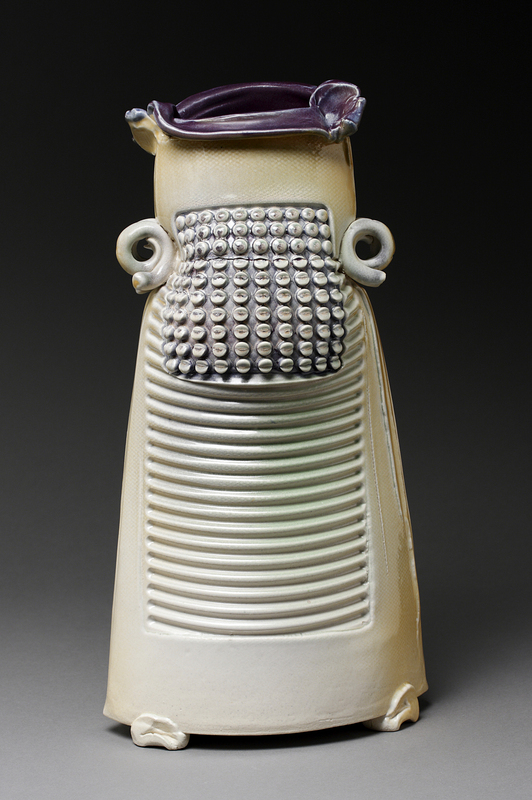 Her ceramic work continued to be about vessels with the hollow forms crossing between sculpture, function, and design. Upon retirement, Sandy moved to Tempe, AZ, where her studio practice continues to emphasize the utilitarian, constructing pieces that are meant to enhance the user’s life. Sandy hopes that the relationship of the placement of the contents into a hand-made vessel will serve as a catalyst for interaction and communication reinforcing the social significance of a dwindling hand-made tradition. We’d love to hear more about your art. What do you do? Why? And what do you hope others will take away from your work? 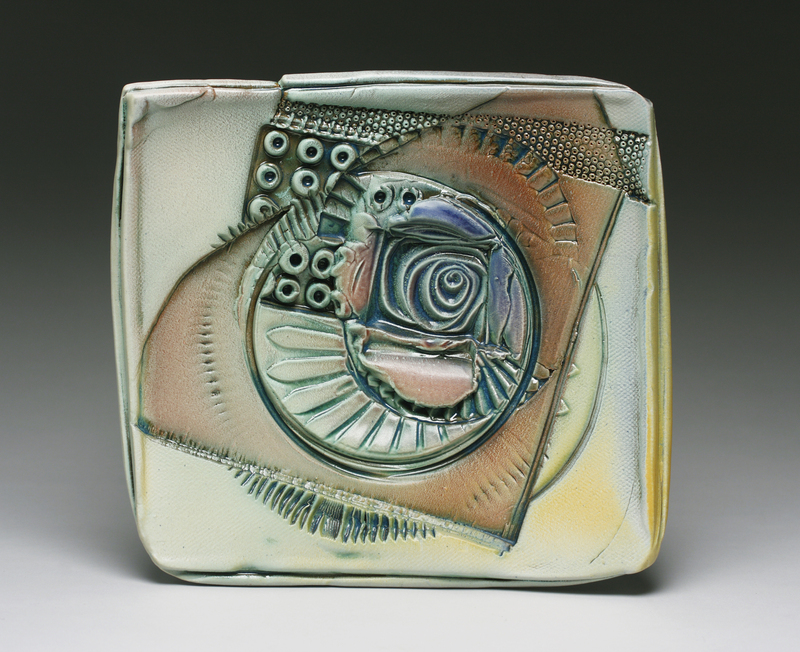 Sandy is a professional studio ceramic artist whose interest relates to forms of containment as well as forms having a strong visual power in their own right. The hand-built constructed pieces contrast the interior volume with their expressive surfaces. Dimensional forms create a fascination with the un-revealed side where the surfaces are also complex with unique impressions. The forms themselves are simplified structures referencing older pots with a historical context or contemporary minimalist architecture. In turn, the surfaces are marked with strong imprints from personally found objects. Focusing on common, everyday but often unrecognizable “stuff” that surrounds us (objects from the street, curb, garage, basement, kitchen drawers), Sandy’s mark-making questions the notion of consumption on a very personal level or on a social level as in mass waste of materials. Sandy uses these graphic elements abstractly impressing them into the clay for high and low relief surfaces. This means of decoration invites the viewer to be reflective and hopefully instills inquiry related to personal associations. Sandy’s work speaks to process – the art of making. She is seduced by the tactile quality and malleability of the clay. 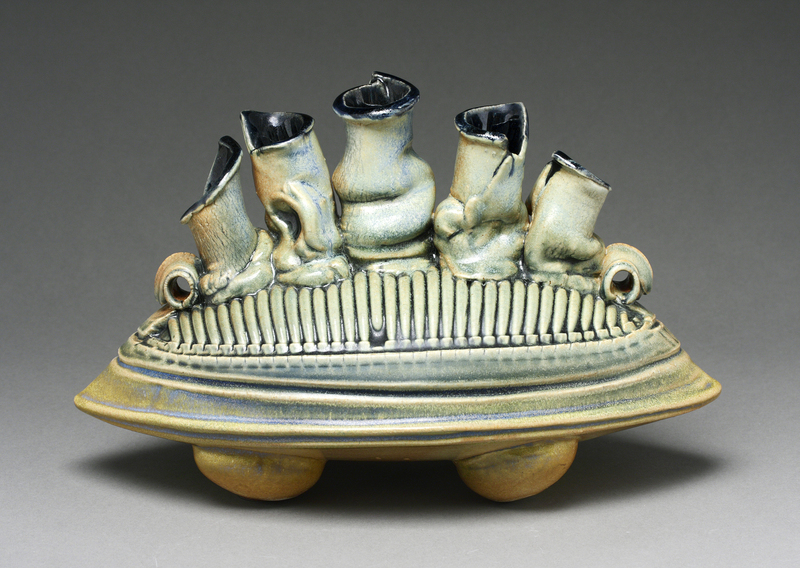 Alternating between dark and light colored stoneware clay bodies, Sandy’s constructions incorporate slab, press mold or coil methods or combinations with wheel thrown parts. Textures are impressed in the initial forming stages with additional mark making by additive and subtractive processes occurring throughout the building process. 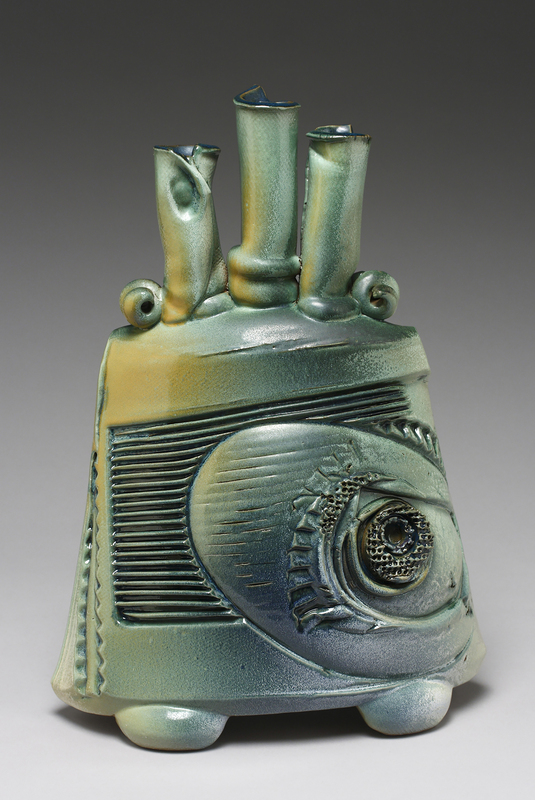 The completed greenware pieces consist of forms and surfaces that are integrated through the use of formal design elements/principles, clay and glaze materials and finally firing. 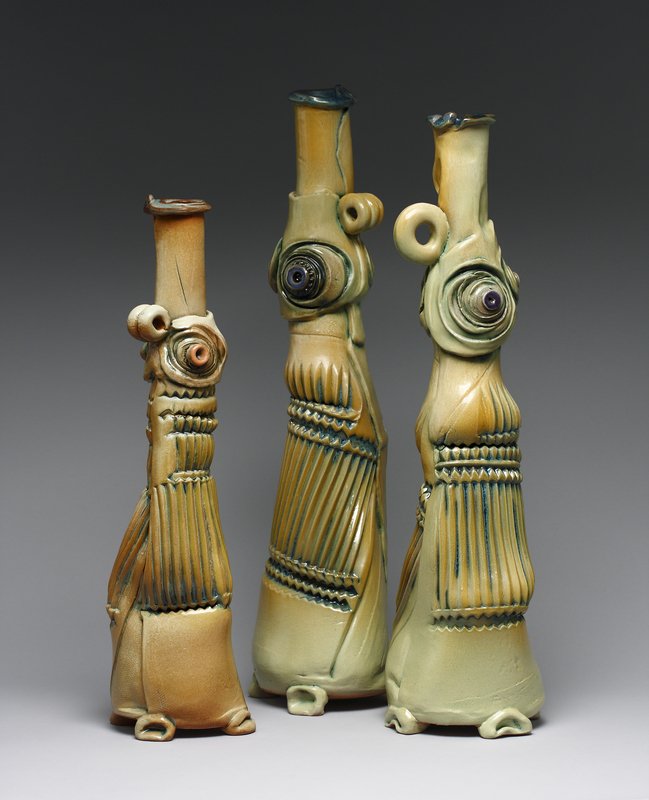 After a lengthy drying period, greenware pieces are fired to 1900°f in her studio electric kiln. 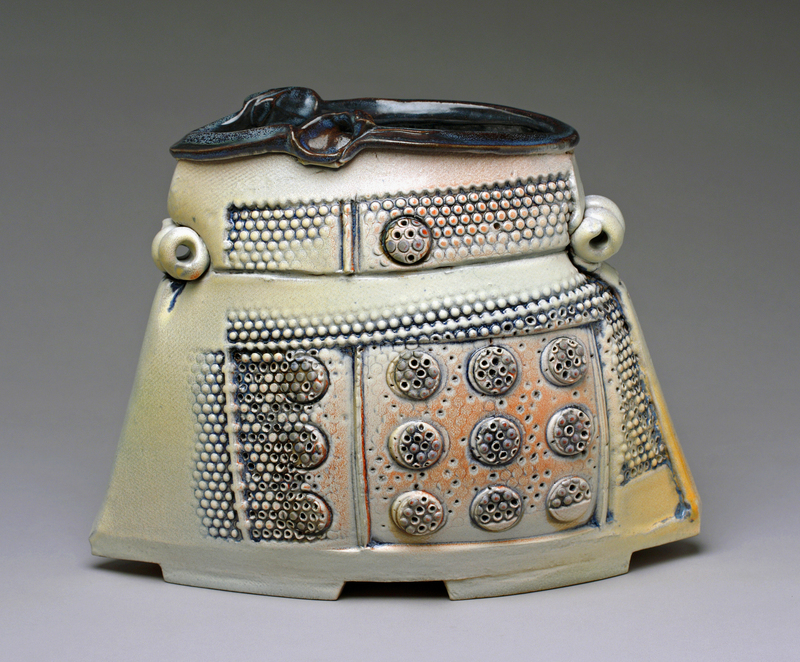 Slips, oxides, and glazes are applied to the bisque ware by brushing, pouring and/or spraying. The pieces are then re-fired to 2160° for approximately 12 to 15 hours. A visual depth and color saturation is developed by layering oxides, matt/gloss glazes, opaque/transparent glazes. The work amasses a patina-like quality with an irregular surface that invites touch and, most importantly, use. Today more than ever people need to be part of a strong art / cultural scene to bring personal fulfillment into their lives. Through Sandy’s current teaching at the Mesa Art Center (MAC), her yearly workshops for Marjon Ceramics and other local and national visual art-craft schools, and working closely with the Ceramic Research Center at Arizona State University (ASU), Sandy is part of meaningful educational experiences providing opportunities for students / practitioners at all levels of ability. She encourages students to develop their own vision, addressing current topics and issues. More and more, Sandy sees a public interested in participating, collaborating or investing in creative experiences. For Sandy, ceramics (the making and sharing) has and continues to be a life-long interest enriching her life and hopefully the lives of others. Sandy’s work is included in major private and public collections throughout the country. It can be seen nationally, regionally and locally in juried and invitational exhibitions. She is represented by River Gallery, Chattanooga, TN. 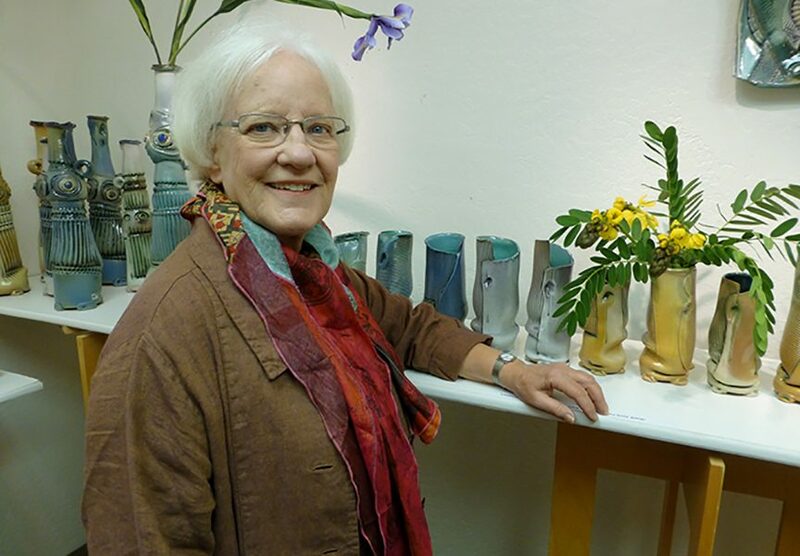 Locally she hosts an annual ceramic studio tour in February in conjunction with the ASU Art Museum. In April, she is part of “Art in the Garden,” Phoenix. In addition, her work can be viewed on-going at the Shemer Art Center and Art One Gallery, Phoenix. Often, when teaching a workshop, her work can be viewed at the specific venue.